Wondering what to expect from Marvel's animated version of The Avengers? Nothing less than the greatest show ever, according to its producer and writer, Craig Kyle. Hyperbole? Maybe he just knows some things we don't. It's going to be the best show ever made. I am so excited about "Avengers" I can't even tell you. It is the comic book put on screen. It is the classic team set in modern day. They're not fighting communists or anything. It is going to be big. It's Iron Man, Captain America, Thor, Hulk, Ant-Man and Wasp. It's the team. It's what you know and love put right on the screen. We are well on our way. It's definitely in heavy production right now as for a premier I do not know? It may be tied to the future film, it may not, I just don't know... With "Hulk Vs." we really got controls taken off as far as violence goes with Wolverine and the Hulk. But I got to tell you, working on "Avengers," that's a cool show. As a comic book fan, I'm so excited about it. I think the reason that animated series get the edge now [over direct-to-DVD features] is because when they're good, you get a lot of more of them. "Hulk vs. Wolverine" was what, 33 minutes? So with shows like "Armored Adventures," "Wolverine and the X-Men" and the upcoming "Avengers," if they're good you get like thirteen hours of them. The best show ever made? Even if you just limit that to animated series, it's got some pretty stiff competition from the 1990s Batman or current fave The Brave and The Bold, but we're willing to be convinced. If nothing else, I'll be happy to see a non-freaky animated Wasp on a weekly basis. 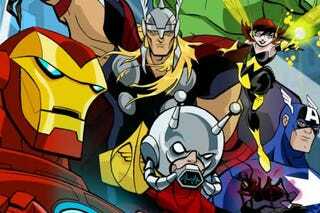 Avengers: Earth's Mightiest Heroes premieres next year.